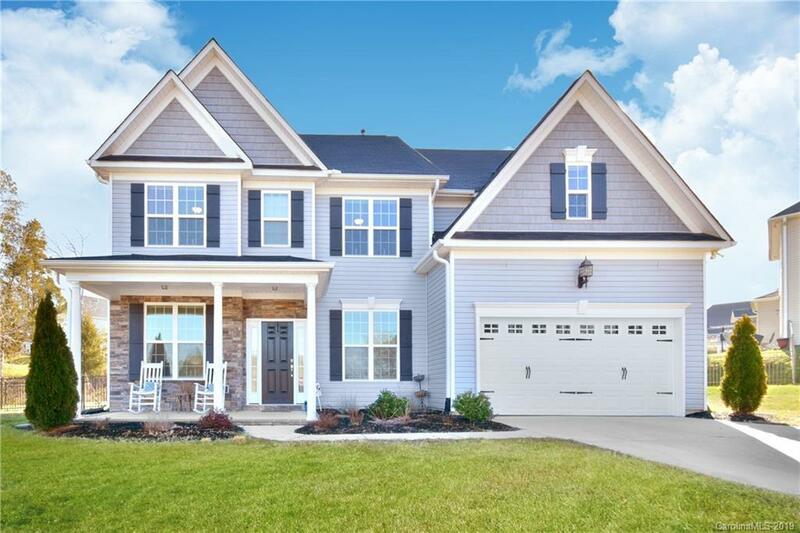 Gorgeous home over 3,000 sqft with an open floor plan! Community Pool & Mt. Pleasant Schools! 1st floor offers; Formal dining w/ coffer ceilings, office/flex room, Spacious great room w/ 2 ft extension & gas logs, Gourmet kitchen w/ upgraded cabinets w/ pull out drawers, granite counter tops, tile backsplash, upgraded deluxe appliances w/double oven, pantry, Upgraded island w/larger breakfast bar, Crown molding & laminate floors thru-out main flr. Spare BR & full bath on main floor w/ upgraded vanity & walk in tile shower. Upstairs offers; 2nd & 3rd BR's w/ walk in closets! Master suite w/ tray ceilings, xtra large walk in closet, upgraded over-sized walk in tile shower & tile floor. Large bonus room that could be used as 5th br w/closet. Would make a great media room already wired for surround sound & projector. Laundry room upgraded w/ cabinets & sink. Tankless water heater, Upgraded light fixtures thru-out the home! Beautiful corner lot w/ fenced back yard and easy access to pool!